providing better tools for the overall process. 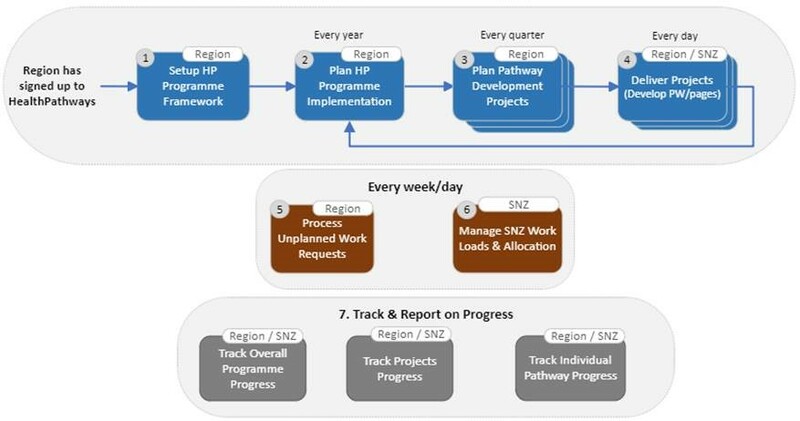 We were aware that the workflow used to manage pathway localisation and reviews varied from region to region within the HealthPathways Community. To get a complete picture, we kicked off the project with a Discovery and Consultation phase. During August, members of the HealthPathways Community and Streamliners Writing Teams provided valuable information through a questionnaire and several workshops. We received 32 responses from 24 HealthPathways teams via the online survey sent to HealthPathways Community members. Within Streamliners, 46 members of the Writing Team completed an internal survey. Overall, we received very positive feedback about the people and communication aspects of working collaboratively on HealthPathways. differences in the way work is resourced and allocated across HealthPathways teams. we need a more seamless way of managing workflow between writing teams and regional HealthPathways teams. Addressing these areas will be the main focus of the Project Flow process improvement work to come. Work on many of these areas is underway, with others planned. Our thanks to all respondents in the HealthPathways Community for the time you took to provide such useful insights. With the Discovery and Consultation phase complete, we’re now moving to the Design Phase of Project Flow. Our goal is to develop an end-to-end process, with support tools, to enable more effective work flow management from your HealthPathways team to the Streamliners writing teams and back again. This “one process, one team” approach will provide shared visibility for all, across programme planning, pathway localisation, and review planning. For our Streamliners Writing Teams, we’re also looking at new resource management and work allocation processes and tools. We aim to complete the Design Phase by late October. By then we expect to have drafted a high-level design and implementation plan for the Development Phase. We’ll ask selected HealthPathways teams for their input in November, before providing another project update to the HealthPathways Community next month.